Conference Facilities South Africa has a comprehensive list of conference venues and centres with conference facilities in the Durban Metro region of the KwaZulu-Natal Province in South Africa. The Durban Metro region is an ideal starting point of any visit to the KwaZulu Natal province of South Africa. Durban is situated on the shores of the Indian Ocean and is the third largest city in South Africa. The region enjoys a year-round warm climate and has an abundance of indigenous and exotic flowering trees, shrubs and gardens. 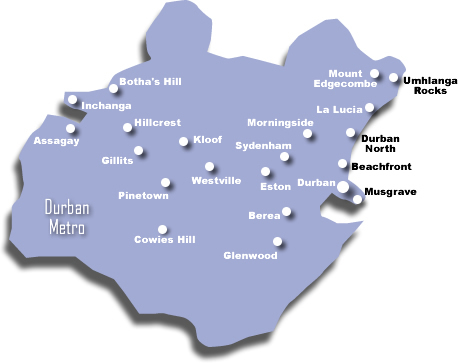 The Durban Metro region is diverse in many of its aspects and this variety is evident in the Victorian houses, in the Hindu temples, Mosques and the skyscrapers of the Durban CBD. Often seen as a place where east meets west, Durban is home to the largest Indian population outside of India. The Durban Metro region of KwaZulu Natal is home to a naturally formed harbour which is the largest and the busiest port in South Africa. There is an extensive road network leading to and from Durban to any destination in South Africa and the Durban International Airport is only a 10 minute drive from the City.This region is also well known for its impressive hotels lining a stretch of beach front known as the Golden Mile. The promenade is a colourful part of Durban dotted with locals selling traditional handicraft, Zulu ricksha drivers, leisurely strollers, joggers, sunbathers and surfers. The beaches of the Durban Metro region in KwaZulu Natal are protected by shark nets and most of the beaches are overseen by lifeguards. Attractions of the Durban Metro region include a visit to Water World, yachting, windsurfing and angling. Organised boat and deep-sea fishing trips are also popular activities. Another must see in the Durban Metro region is uShaka Marine World where a variety of marine animals are on display such as sharks and turtles. Daily seal and dolphin shows are held at the dolphinarium. Another popular attraction in the Durban Metro region of KwaZulu Natal is the Fitszimons Snake Park. It is an important snake research centre where lectures and venom-milking demonstrations are held for the public. The park is inhabited by a host of South African and exotic snake species. The park places a strong emphasis on education and the important role snakes play in their natural environment. Some of the more important towns of the KwaZulu Natal's Durban Metro region are Berea, Bluff, Botha's Hill, Cowies Hill, Durban City, Durban North, Essenwood, Eston, Gillits, Glenashley, Glenwood, Greyville, Hillcrest, Inchanga, Kloof, La Lucia, Morningside, Mount Edgecombe, Musgrave, Pinetown, Queensburgh, Sherwood, Sydenham, Umhlanga Rocks, Westville and Yellowwood Park.